The Shakespeare and Company library is an English-language bookshop in the heart of Paris, founded by George Whitman in 1951. Takagicapéran has been working recently with his daughter Sylvia Whitman now running the store; first on the remodeling of the main store entrance and the antiquarian, then on their new Café opening next door. The aim of the Café was to continue the story originally written by George. To that extent it was very important to convey a sense of belonging to the place, to anchor it in its history and link it to the library. 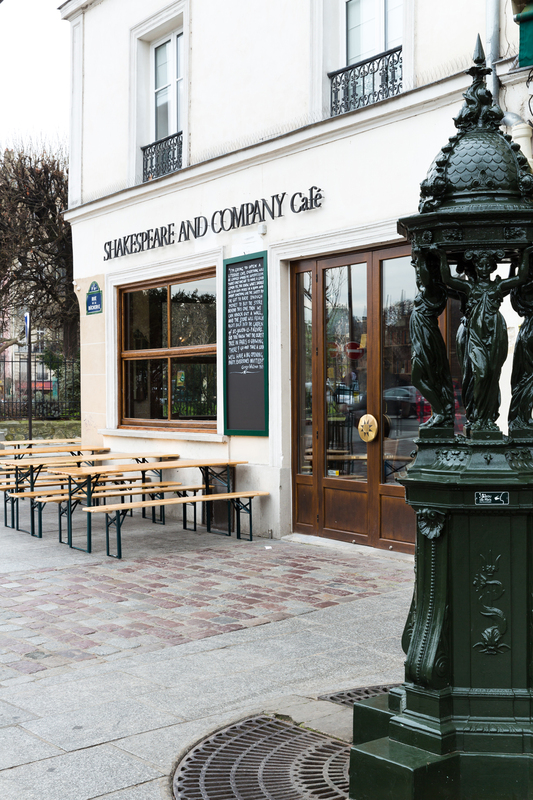 The premise of Shakespeare and Company Café used to be a stationary shop, then a garage and was empty for over twenty years. When recovered, the main space was a kitchen with an adjacent garage. The original stone masonery of the 17th century building was restored as well as the more recent mechanical oak “fenêtres à guillotine”. 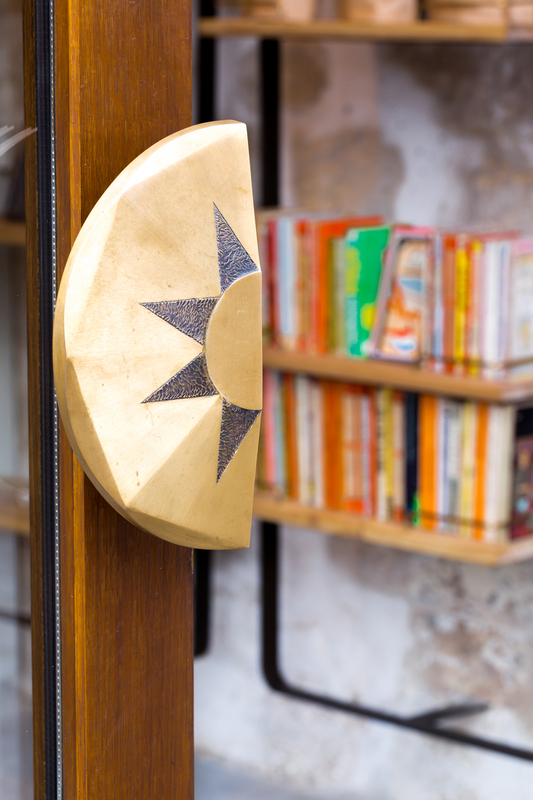 New doors to either side were introduced to match these architraves and a bespoke satin brass handle was developed in honor of the iconic location of the café: the “point zero”. 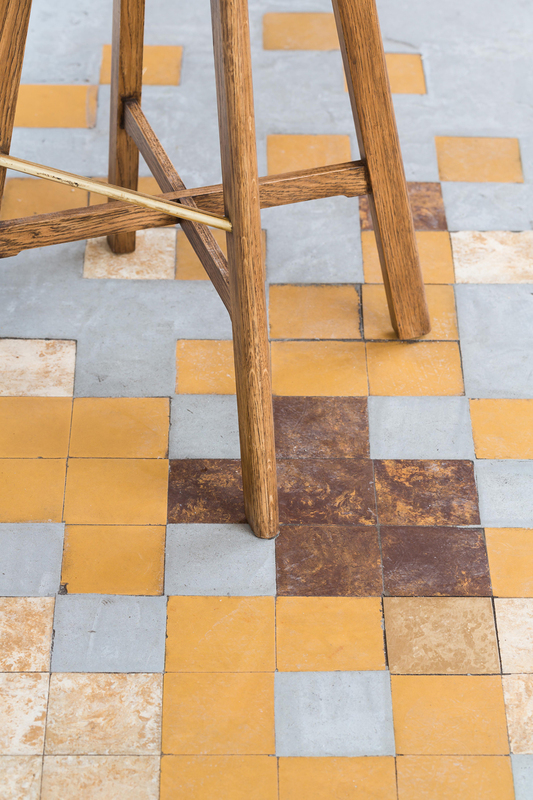 The 60’s kitchen pattern tiling was deconstructed and re-laid in a concrete flooring to link what used to be two rooms in one. 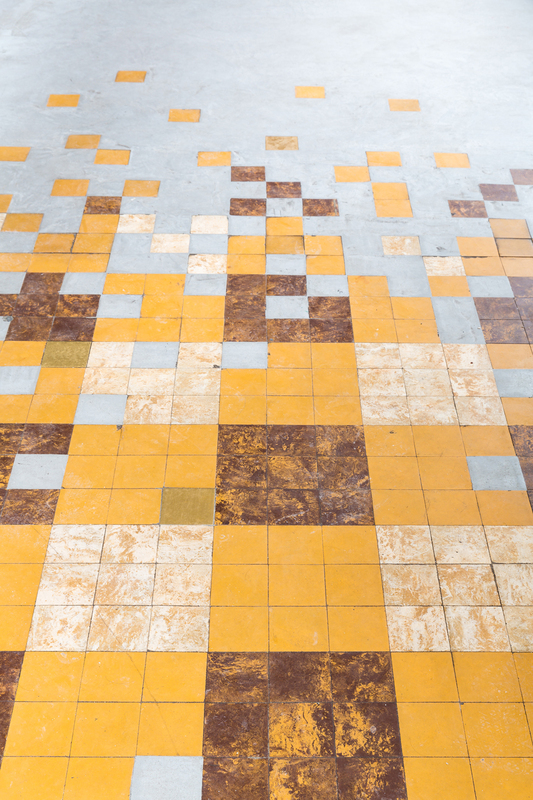 Some brass tiles were randomly laid throughout the store to guide customers in their discovery. The timber garage doors were stripped out and recycled to create the pattern of the library wall hiding the restrooms. 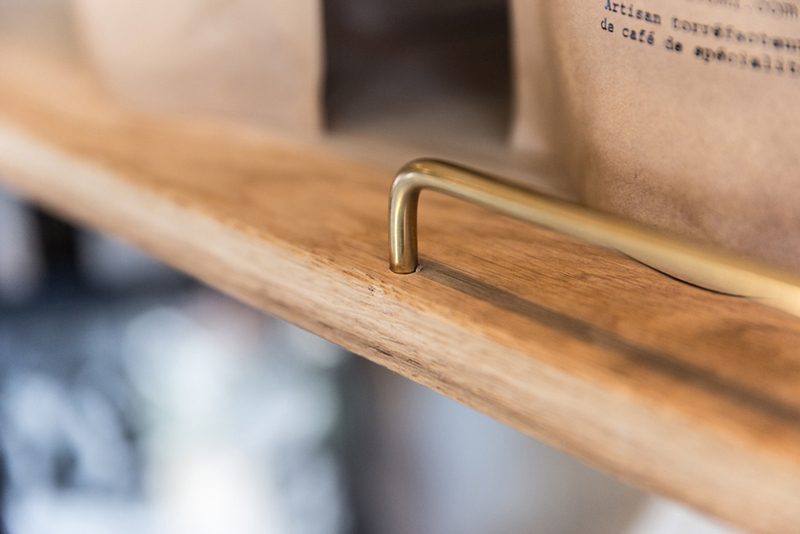 Oak shelves are floating to the front thanks to thin integrated brass brackets. 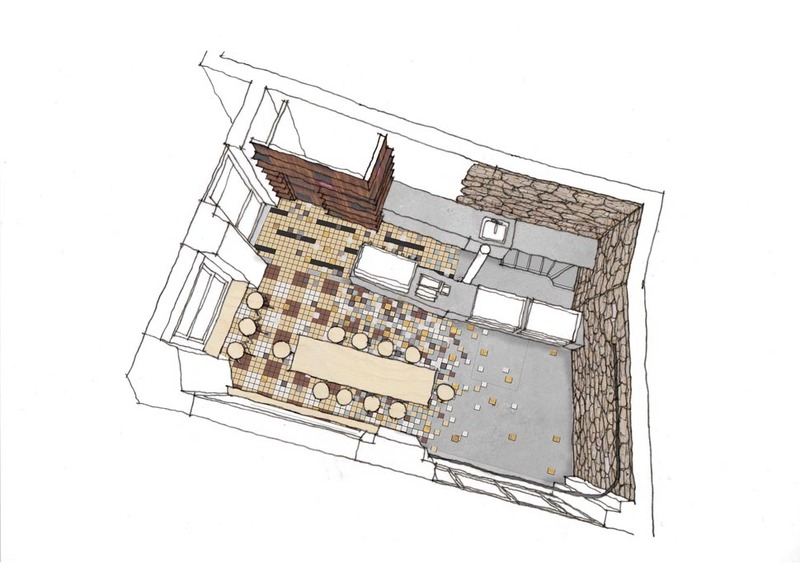 The main counter is a tone-on-tone soft and minimal piece of furniture, integrating two food and beverage vitrines. 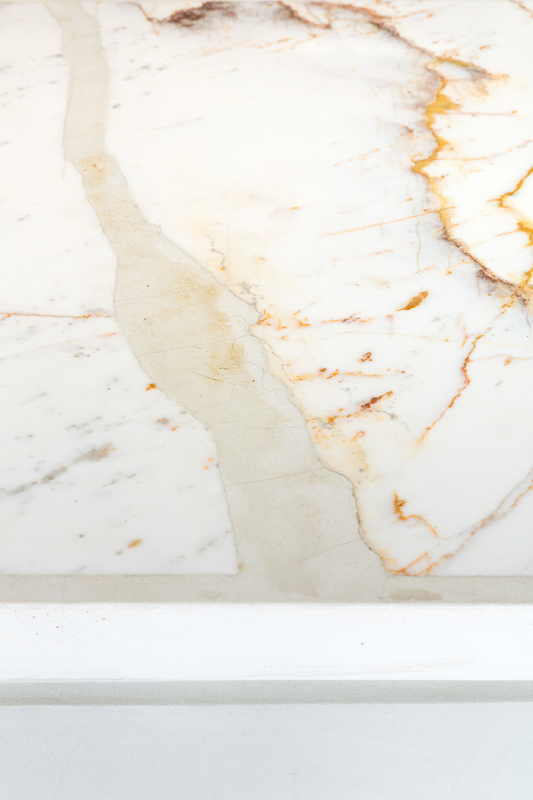 The off-white resin render of its body is completed by a refined tabletop: a broken Statuary marble slab cast in off-white concrete, creating a very subtle contrast. This soft approach is further enhanced by the white porcelain Astier de Villate suspensions above the counter. 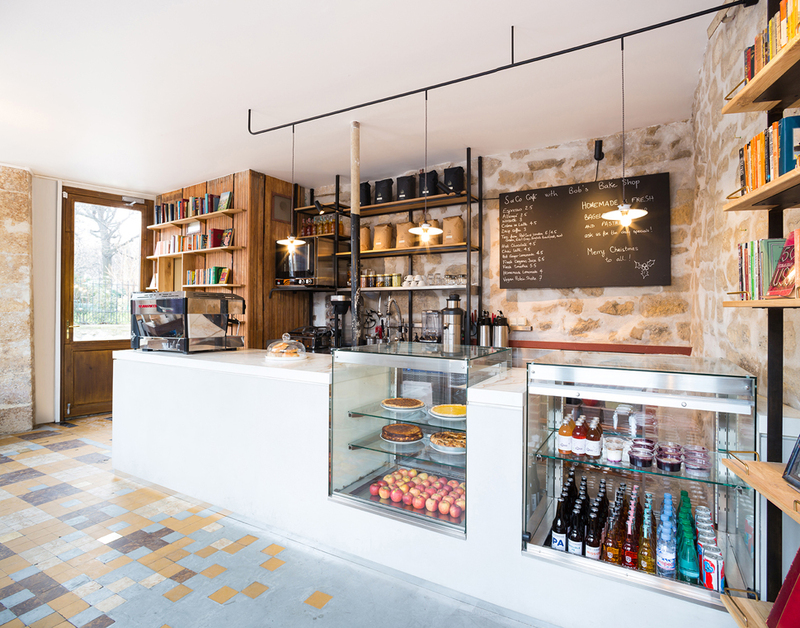 In contrast to this white monolithic feature, the main suspension and shelving behind and to the side of the counter are composed of thin black hematite metal frames with oak shelves which allows the stonewall to breath. 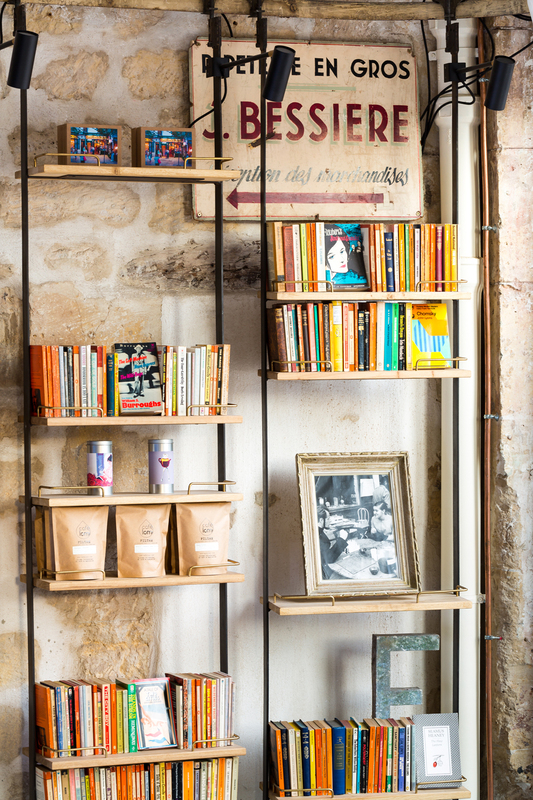 The side entrance shelves use the original garage doors sliding system and can be laid behind the windows. 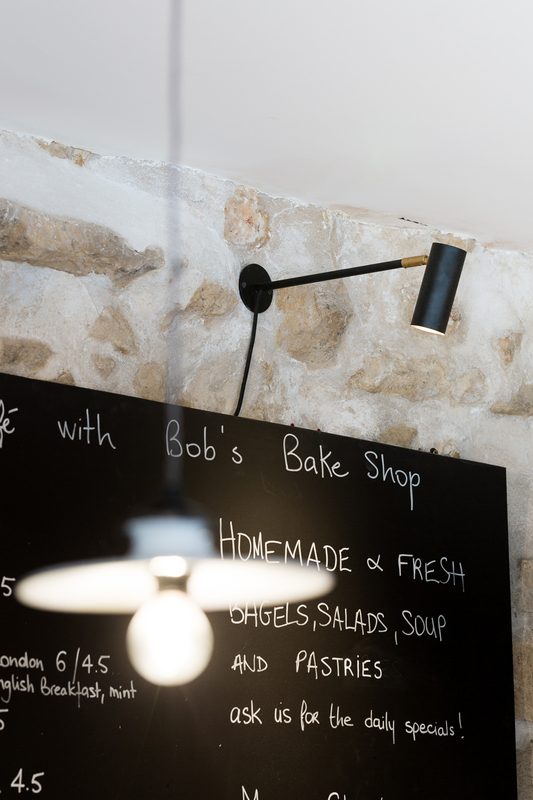 Brass and black metal Rubn integrated spot lights complete this installation. 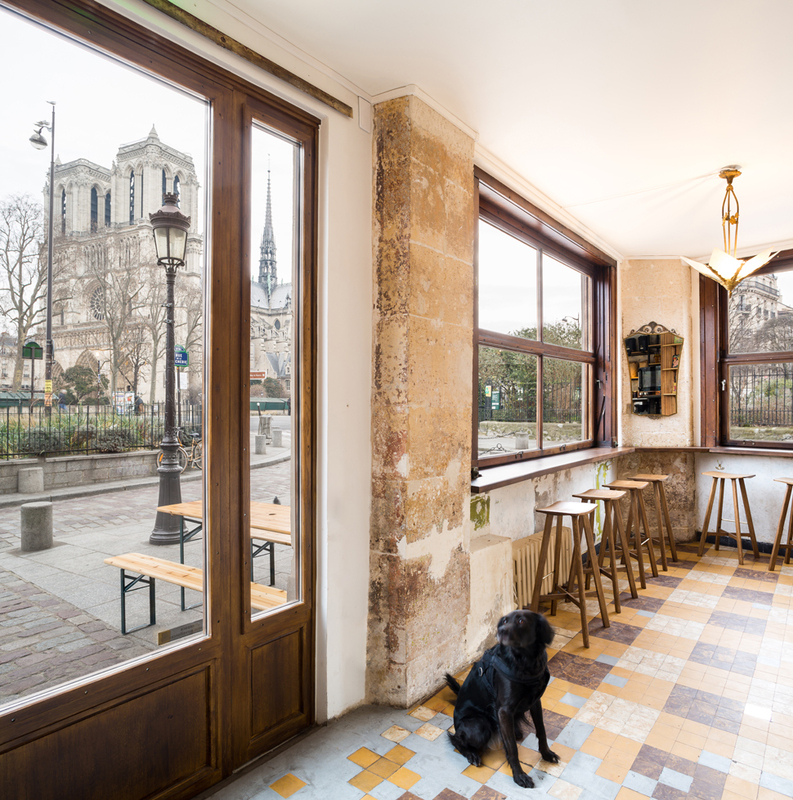 The seating area is composed of an oak counter running along the two windows to admire the view of Notre Dame. Wooden stools, bistrot table and chairs lay below a 1930’s vintage chandelier. 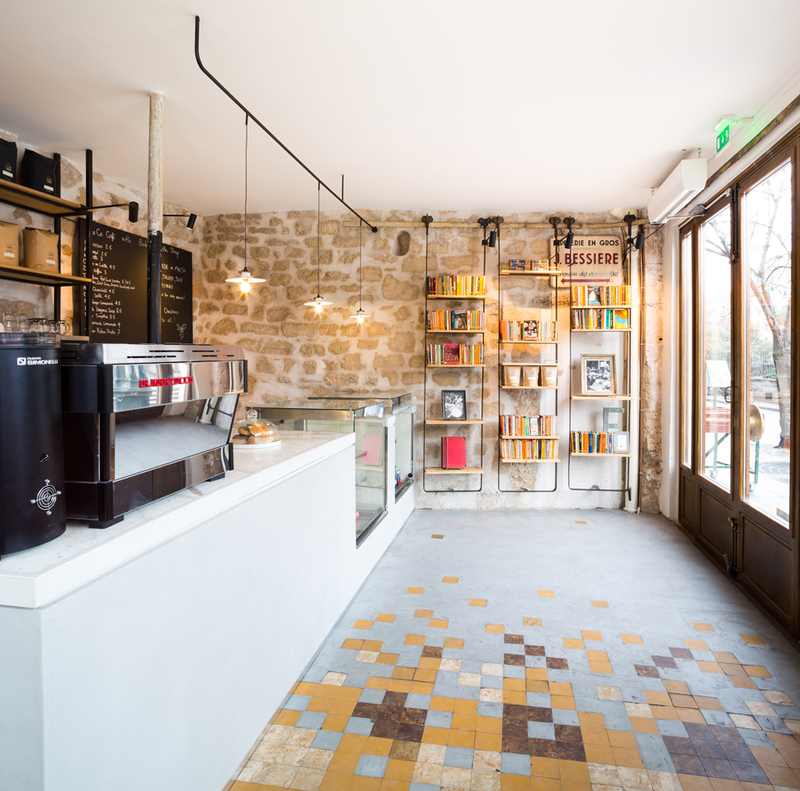 The overall result is an eclectic, sometimes quirky, but always tasteful mix of elements and creates a familiar interior, a modernized and cosy Café for the literary customers of the main stores.